Vodafone India today announced their half yearly financial results for the 6 month period between April-September, 2013. Their total revenue for this period was Rs 18,480 crore, which is an increase of 13.5% compared to last year. But the single most important growth which was observed in Vodafone’s financial result was revenues from Internet (Data) usage: 76.5% increase compared to last year. Between April to September, Vodafone customers spent Rs 1500 crore on using Internet on their smartphones, and this suggest us that mobile usage among Indians is still witnessing a robust growth rate. This amounts to 9% of service revenues, which is a kind of record of Vodafone. Indians have never used Internet so lavishly in the past! Vodafone has 4.2 crore data users, out of which 45 lakh are 3G users. During this period, these 45 lakh 3G customers used 634 MB/user of data, which increased from 419 MB/user in the last year. Another crucial observation was that smartphone usage has penetrated to 10.7% of total user base. Partial effect of seasonality and regulatory changes which happened during the period. With a healthy operational free cash flow of Rs 4770.06 crore, Vodafone witnessed an increase of 41.2% compared to last year. In the same period, Vodafone spend Rs 1908 crore on capital expenditure such as setting up infrastructure for data usage, towers and customer service. If we observe the whole Indian telecommunications industry, then Vodafone India has successfully sliced out 21.9% market share, which saw an increase of 0.9% compared to last year. Average Revenue Per User was Rs 200, with an active and loyal userbase of 96%. Vodafone Business Services is another area which is witnessing tremendous growth. Right now, 10% of all revenues are originating from business services with 45 lakh business customers. At 96 Lakh, Vodafone has the largest postpaid customer base in the country. Overall, Vodafone is the third biggest telecommunication company in India, after Airtel and Reliance communications. 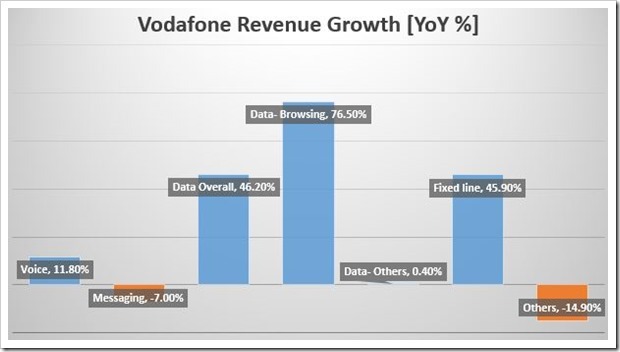 Vodafone India team would be certainly buoyed by this excellent results. They have already stated in the past that once their tax issues are resolved, an IPO is on the cards. And their M-Pesa mobile payment product is also getting traction, with ICICI bank partnering with Vodafone to launch their services in North-East. It would be interesting to observe how their biggest competitors right now, Idea, reacts to these initiatives by Vodafone.